Against pro-nuclear ‘ecomodernism’, we should reaffirm the fundamental incompatibility between ecologism and modernization. How did we come to this point: a pro-nuclear political ecology? The philosophical premises of the manifesto can be partly traced to the work of Bruno Latour, a supporter of ‘post-environmentalism’. For Latour, there is not—and there should not be—any separation between humans and nature. We have never been truly modern, Latour argues, in so far as existing modernity has sought to liberate humans from nature, and ignore its effects to it. To become truly modern, we have to take final responsibility of our products and their effects: we should control our technological ‘Frankensteins’, rather than shy away from producing them. Slavoj Zizek, in arguing that ‘nature does not exist’, strikes a similar tone: ‘we are within technology… and we should remain strongly within it’. For Zizek, like Latour, there is no going back to an un-alienated relationship with nature; we should double up our efforts and become in control of our alienation. Zizek’s communist politics are worlds apart from the green, somewhat statist, capitalism of post-environmentalists. But I am afraid that, as far as our metabolic relationship to the non-human world is concerned, the result is the same, independent of whether the control of the means of producing this metabolism is to be private, state or communal. Claiming that ‘there is nothing unnatural about nuclear power plants’ (paraphrasing David Harvey’s dictum about New York city) we risk reproducing the logic of the Soviet regime, where environmental problems did not exist, in so far as what was being produced was by the people and for the people. A stance on ‘ecology’ is necessary. Including by the eco-modernizers, whose manifesto without an ‘eco’ becomes a pure call for modernization, advocating nuclear power for the sake of nuclear power. To justify the ‘eco’ in the title, the manifesto performs theoretical acrobatics, arguing that somehow a more intense use of technology will liberate space and resources for preserving wilderness. This is not only factually wrong. It is also inconsistent with the overall premise of the manifesto that there is no wild nature out there independent of us. Contra Latour, the manifesto continues to treat nature as a means to an end (in that case using this nature more intensively to save that other, wild nature). And it assumes that somehow magically the resource extraction and transformations we conduct ‘here’ will not affect nature ‘out there’. In effect, the manifesto is what Latour criticizes as modernism 1.0; that is, a modernism still premised on the idea of separating ourselves from the non-human world. Paradoxically, Latour’s own work can come to our rescue from the eco-modernizers. After all, he is the guy who wrote: ‘to modernize or to ecologize – that’s the question’. Indeed, unlike the eco-modernists, Latour argues that the ‘challenge demands more of us than simply embracing technology and innovation. It requires exchanging the modernist notion of modernity for what I have called a “compositionist” [note: what when younger he called ‘ecologist’] one that sees the process of human development as neither liberation from Nature nor as a fall from it, but rather as a process of becoming ever-more attached to, and intimate with, a panoply of nonhuman natures’. And here is the mistake (dare I say in the knowledge that they will never read me) of Latour or Zizek. Recognizing our alienation from nature, and the power to contribute to the production of new socio-natures, does not logically lead to the conclusion that more ‘control’ or more and bigger technology is what we should do. There are multiple ways in which we can become ‘ever-more attached to … nonhuman natures’. And there are many ways (technologies) and associated socionatures we can produce. We can choose a world of bicycles or spacecrafts and we can choose a world powered by DIY-windmills or by nuclear plants. Each suggests a different type of connection and relation with the non-human world. There is nothing to suggest that we connect more to a river by damming it and using it to produce electricity, than by walking along its shores or talking to it. The ecologist movement has always been about a different type of connection, both among humans, and between humans and nonhumans. It has advocated smaller scale, and more direct connections, what Ivan Illich called ‘convivial’ relations: technologies that can be controlled by their users, and not by others on their behalf. The ecologist movement was always against nuclear power, not only because of its indisputable and terrible environmental risks and effects, but because it didn’t fit with its vision of the good and just life. Contra Zizek, the hypothesis for radical ecologists is, as Illich put it, that ‘socialism will come on a bicycle’: large-scale technological systems create a society divided into experts and users. It is only a short pass for the former to become the bureaucrats or the bosses who control and appropriate the surplus of the system. A society powered by nuclear energy cannot be a society of equals or of mutual aid. The ecologists’ call for limits to growth has mistakenly been thought of as a call for a harmonious co-existence with nature, one of leaving ‘nature’ alone (I am not denying that many ecologists argue for limits on these grounds, but I believe they are wrong). On the contrary, as we have argued elsewhere, the basis for limits should be different: fully aware of our capacity to keep pursuing what can be pursued, the choice is ‘not to’. We ecologists do not want to produce radioactive or genetically modified Frankensteins. This ‘not to’ is an affirmative choice for the world we want to produce, a world where we live a simpler life, in common, a world of connection rather than disconnection, approaching rather than distancing, coupling rather than decoupling. A world where we control the controllers. This is an ecological vision. The choice has always been, and still is, the same. To modernize or to ecologize? That is the question. 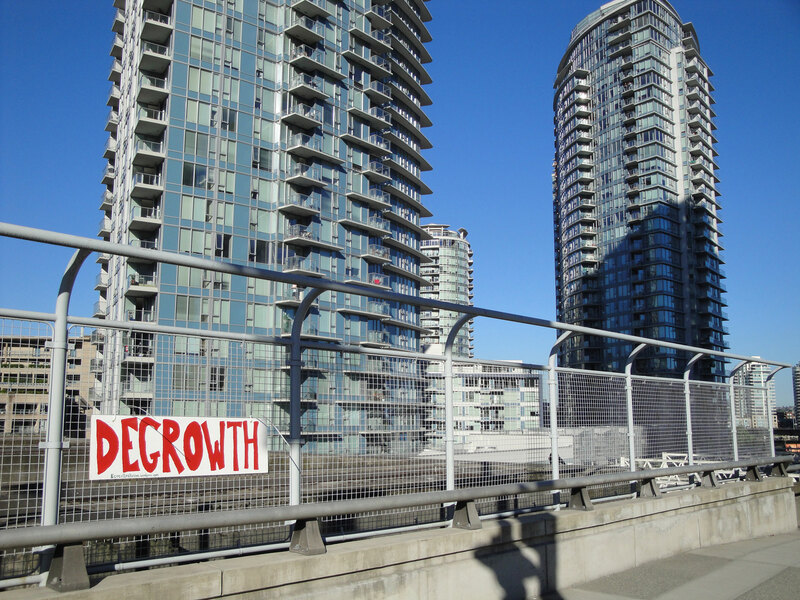 A longer version of this post has been published on degrowth.de.